We’d love your help. 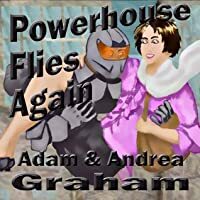 Let us know what’s wrong with this preview of Powerhouse Flies Again by Adam Graham. Dave Johnson is a has been. Formerly Powerhouse, the Champion of Seattle, Dave lost his superpowers a year ago but still misses the adventure and opportunity to make a difference. Powerhouse may be gone from Seattle, but not forgotten. The city he served remembers him fondly or breaking the hold of a crime syndicate on the city. A cult of personality has formed around the l Dave Johnson is a has been. Powerhouse may be gone from Seattle, but not forgotten. The city he served remembers him fondly or breaking the hold of a crime syndicate on the city. A cult of personality has formed around the long-missing superhero as a symbol of hope in the often gloomy Emerald City. Mitch Farrow is the new CEO of Dorado Incorporated, and secret liaison for trans-dimensional aliens who seek to create cynicism in order to reduce public resistance to their planned invasion. Farrow believes the alien takeover will bring about an end to earth's suffering and cure his ex-wife and daughter. Seeing Powerhouse's squeaky clean image as a threat, Farrow launches an attack on Powerhouse's character and effectiveness. Dave is given a chance to come back as Powerhouse. He's determined to make a lasting difference for the people of Seattle, but to do so he'll need help. Will Powerhouse succeed? To ask other readers questions about Powerhouse Flies Again, please sign up. This was offered for free for the Kindle so I picked it up. Maybe I misunderstood because I thought it was listed as book 1 of a series. But here on Goodreads it's listed as book 1 1/2. Which seems about right. It seemed to be written between two stories. No big conflicts, it mentioned a conflict in the past and hinted toward a conflict in the future. The unbearable thing for me about this book was that the story ended not just with a cliffhanger, but the feeling that the author hadn't even handl This was offered for free for the Kindle so I picked it up. Maybe I misunderstood because I thought it was listed as book 1 of a series. But here on Goodreads it's listed as book 1 1/2. Which seems about right. It seemed to be written between two stories. No big conflicts, it mentioned a conflict in the past and hinted toward a conflict in the future. The unbearable thing for me about this book was that the story ended not just with a cliffhanger, but the feeling that the author hadn't even handled the conflict he built. Had someone had started a book, got tired , and published what they'd written so far? I understand that free books are given to promote an author. And the author wants you to pay for the next one. But it felt very bait-and-switch-y. Finish the story and if I like it, I'll try the others. Comedy, Action, Inspiration. A great read! However, be sure to read Tales of the Dim Knight first!